A chocolaty, hazelnut spread meets cream cheese and fresh strawberries all grilled on a buttery croissant! I’ve used this delicious spread so many ways especially when baking but I’ve never tried using it on a sandwich. How about that?!?! I decided to add cream cheese and sweet strawberries and grill it all between a croissant. OMG! This sandwich was a huge hit for hubby! He was so surprised that the flavors all worked so well together. He’s not really fond of sweets but he enjoyed it so much so that he didn’t want me to have even one bite of his. I believe his exact words were, “Get your own!” 🙂 I guess I’ll give him a pass this one time! Start by heating your griddle or skillet over medium low heat. Once the griddle is heated, melt some butter evenly to coat. Cut your croissants in half and place them cut side down until browned. Flip them over to grill the other side; adding more butter if necessary. Once both sides are browned, remove from the griddle and spread the bottom halves of the croissants with 2 T. of whipped cream cheese, then top with 2 sliced strawberries. Now spread 2 T. of Nutella on the top halves of the croissant and place on top of the strawberries. Return the entire sandwich (bottom side down) to the griddle and grill for about 2-3 minutes allowing everything to melt together. I place a saucepan top over the sandwich to bring things together rather quickly. Say Grace and enjoy! 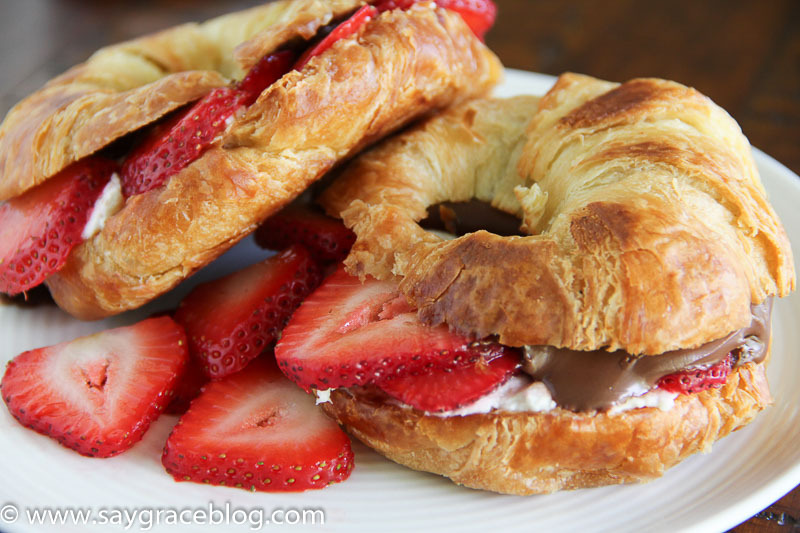 A chocolaty spread meets cream cheese and fresh strawberries all grilled on a buttery croissant! Start by heating a griddle or skillet over medium low heat. Once the griddle is heated, melt some butter evenly to coat. Cut your croissants in half and place them cut side down until browned. Flip them over to grill the other side; adding more butter if necessary. Once both sides are browned, remove from the griddle and spread the bottom halves of the croissants with 2 T. of whipped cream cheese, then top with 2 sliced strawberries. 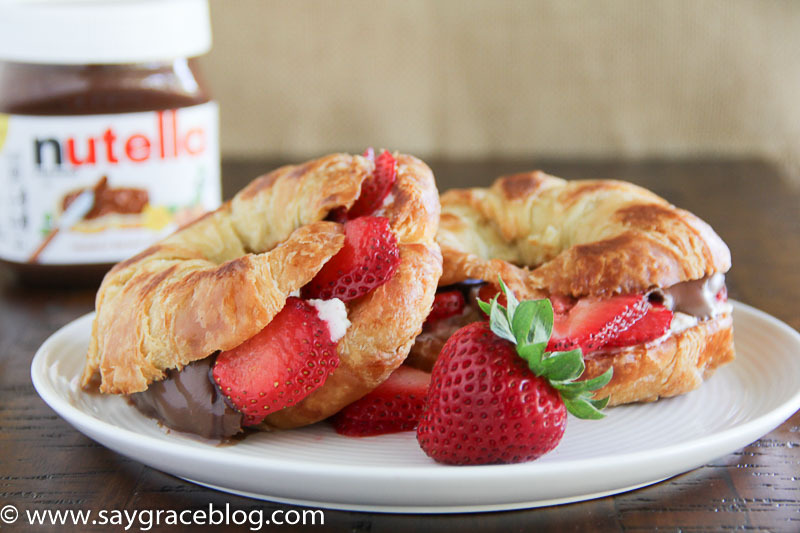 Spread 2 T. of Nutella on the top halves of the croissant and place on top of the strawberries. Return the entire assembled sandwich (bottom side down) to the griddle and grill for about 2-3 minutes allowing everything to melt together. Say Grace and enjoy! I couldn’t believe that a sandwich without meat could taste so good. The buttery grilled croissant was a nice touch. OMG my boys would love these!! How yummy!! For sure, Jen! My big “hubby” boy even loved it! 🙂 Let me know how they turn out for you.